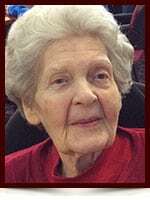 Lillias May Waldren - Edmonton's Burial & Cremation Professionals | Trinity Funeral Home Ltd.
On February 21, 2015 Mrs. Lillias May Waldren passed away peacefully at the age of 91 years. She is survived by her loving children: Linda (Len), Janet, David (Jacquie) and Lyle (Faye); Grandchildren: Darren (Joanne), Ken (Lori), Miranda, Donna (Bruce), Parker and Quinn; Great-grandchildren: Reilly, Braden, Zachary, Dustin, Madison, Taylor and Cody and Great-great-grandchild, Caitlynn. So sorry to hear of Aunt Lillias’s passing. She was a wonderful lady. I was always amazed when we were younger that she would recognize us no matter how long it had been between visits. She would greet me like it was only a day between visits instead of years. She will be missed and forever in my heart.